The N-Curve effect is a reality of all test automation efforts. The premise of the N-Curve effect is that is takes significant effort to get the initial test cases automated but will typically get easier over time. It’s important to set an expectation when developing test automation that initial development will take significant effort to see your first results, ROI is rarely realized early in the test automation effort. 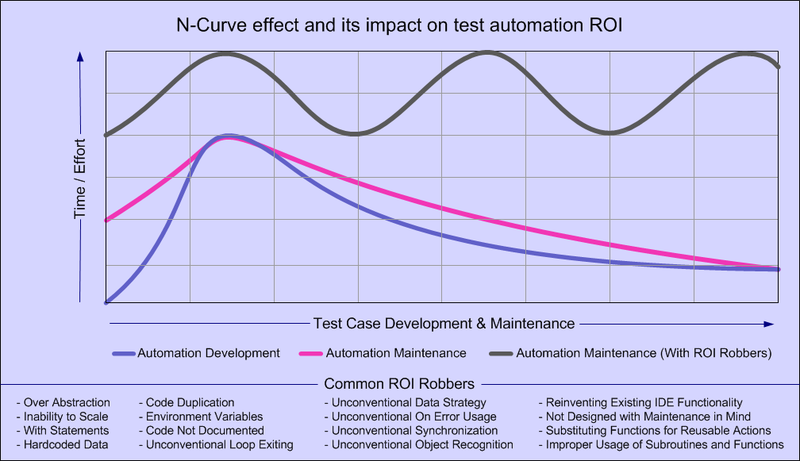 Learn about common ROI Robbers in test automation that can directly influence this curve and possibly lead to the dreaded ROI Rollercoaster seen in the topmost line in this graph.